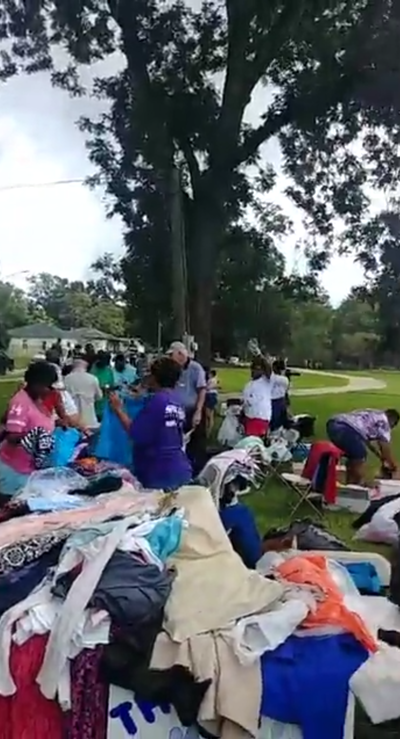 ​1st Annual DRMI STREET CORNER GIVEAWAY - DIVINE REVELATIONS MINISTRIES, INC.
Click picture above to view the Facebook Live video. 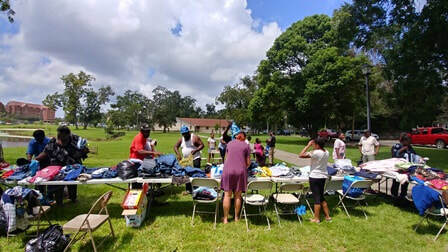 ​Tallahassee, Florida – Divine Revelations Ministries, Inc. (DRMI) sponsored its 1st Annual DRMI Street Corner Giveaway at the Carter Howell Strong Park in the Frenchtown Community of Tallahassee (N. Copeland St.), on Saturday, August 25, 2018 from 12 noon to 3:00 p.m. DRMI is so thankful to all of the wonderful volunteers who joined us to make this event a HUGE success! We served almost 90 individuals in our first event. Thanks to generous donors, those in need were able to eat & "shop" for free clothes and shoes, got their hair done, finger nails painted and face painting for their children. 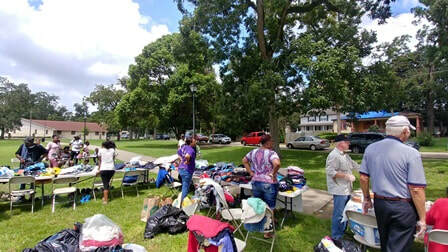 The DRMI Street Corner Giveaway is a rent-free, premise free, free pop-up department store concept designed to give away clothing to the community’s homeless and those in need. The original concept of this type of event was pioneered in Cape Town, South Africa. This new DRMI sponsored annual event is designed for the homeless but was open to the public. A special "Thank You!" to DRMI Board Members, Sunshine Hair Salon, Holy Cross Anglican church, the Florida Peer Support Association, Panera Bread's End of Day Dough-Nation Program for "sweet treats", co-workers, classmates, college students & other young people, and even a couple of politicians who joined us for the event. Together and united as ONE, we served 86 men, women and 23 children who inspired us with their humor and patience, but most of all by sharing their stores and expressions of gratitude. So until the next time...THANK YOU, THANK YOU, THANK YOU FROM DRMI! Divine Revelations Ministries, Inc. is a 501c3 public charity organization with the IRS and donations are tax deductible. The mission of DRMI is to help all people live more enriching lives. DRMI supports the local community through volunteerism, behind-the-walls and reentry programs, financial crisis assistance, donations, outreach activities and referrals to other community resources.